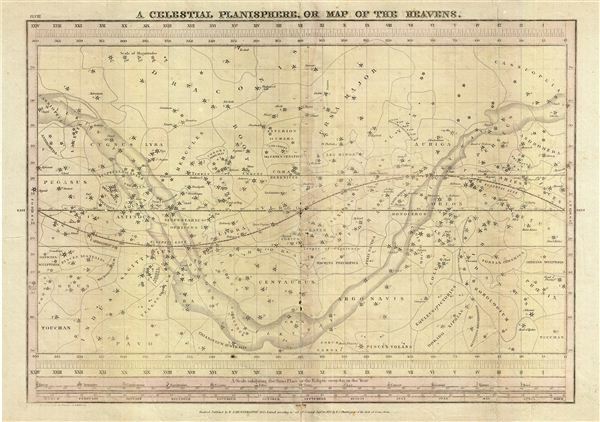 A Celestial Planisphere, or Map of the Heavens. Burritt, E., Atlas, Designed to Illustrate the Geography of the Heavens, 1835 edition. Good. Typical overall toning and some soiling. Original centerfold. Minor wear along fold lines. Verso repair extending 1 inch near left margin. Professionally flattened and backed with archival Japanese tissue for stability. Rumsey 2853.003. Kanas, N., Star Maps, p. 277-78. Kidwell, Peggy Aldrich, Elijah Burritt and the 'Geography of the Heavens. ', Sky & Telescope 69 (Jan 1985).